Goshen College President Jim Brenneman and Shane Claiborne, author and Christian activist, have been emailing for the past six months, discussing and processing last spring’s decision to play the national anthem before select sporting events at the college. On Tuesday night, their emails were published on the Sojourner’s God’s Politics blog so the public could take part in the conversation as well. Sojourners is the largest network of progressive Christians in the United States and through a website and magazine, works to articulate the biblical call to social justice. “(Claiborne) has a generous spirit that permeates his deep convictions,” said Brenneman, who first met Claiborne in person during his visit to Goshen in 2009. When Claiborne emailed Brenneman about the national anthem last winter, Jodi Beyeler, news bureau director, wondered if it would be a chance to begin a more formal email correspondence with a possibility of end publication.When Beyeler emailed Claiborne to ask if he would be open to the idea, Claiborne accepted and Brenneman sent his first email reply on April 20. Brenneman said the presence of grace in his conversations with Claiborne marked the dialogue as different from other conversations he had, regarding the decision to play the national anthem. When the conversation continued through the summer, Beyeler and Brenneman brainstormed publication venues. Although other blogs expressed interest, the conversation is now published on the Sojourners God’s Politics blog. “Sojourners felt like it was in line with what they’re trying to communicate, too,” said Beyeler. The dialogue between Brenneman and Claiborne is published in two parts. Part I provides background on each individual and describes the events that led up last spring’s Goshen College Board of Directors’ decision to accept Brenneman’s movement to allow playing of the national anthem at sporting events on campus. The page, titled ‘”Oh Say Can You See”: Learning to Disagree in Love (Part 1)” invites readers to click on a link that provides the full email conversation between the two. The emails date from Feb. 18 to Sept. 9, 2010. Brenneman said he plans to stay in touch with Claiborne. “There’s a lot we could continue talking about,” he said. To read “Oh Say Can You See”: Learning to Disagree in Love,” visit http://blog.sojo.net/2010/09/28/oh-say-can-you-see-learning-to-disagree-in-love/. 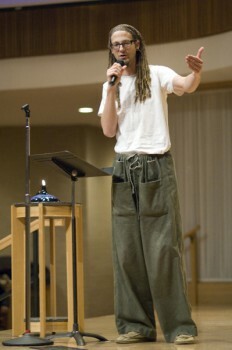 To read more about Shane Claiborne’s intentional faith community in Philadelphia, The Simple Way, visit www.thesimpleway.org/.